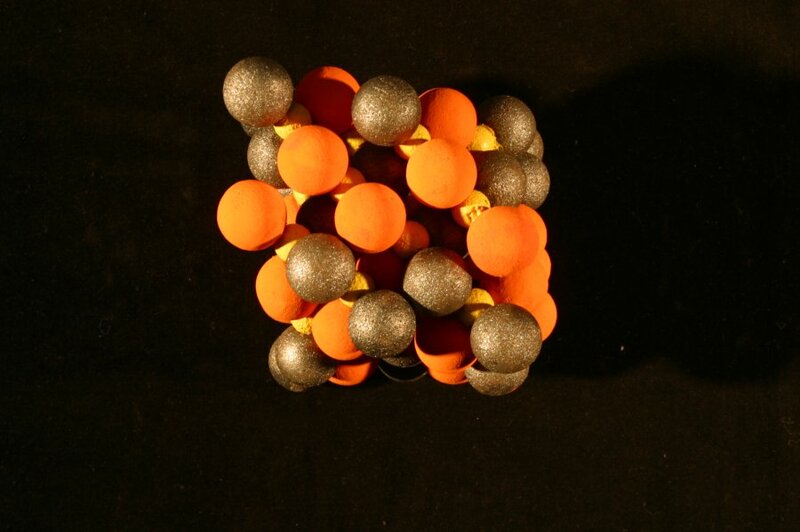 A tetragonal crystal system constructed from sulfur atoms surrounded by two copper atoms and two iron atoms each at the corners of a nearly regular tetrahedron. 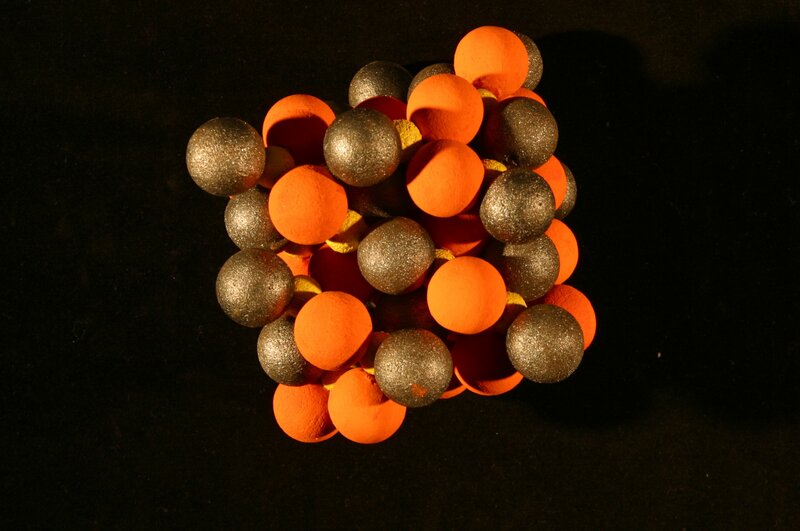 Each metal atom is surrounded by four sulfur atoms. In the early 1930s, Pauling was finishing his work with silicate structure determinations, and began to analyze the crystal structures of sulfide minerals. Pauling opened his study of sulfides with a reinvestigation of chalcopyrite, the structure of which had already been published by C. Lalor Burdick and James H. Ellis in 1917. C. Lalor Burdick received his M.S. degree from the Massachusetts Institute of Technology in 1914 and his Ph.D. from the University of Basel in 1915. He learned how to use an X-ray ionization spectrometer in the Braggs’ London laboratory, and built one at MIT before moving to Pasadena in 1916. James H. Ellis, a research professor of physical chemistry at Caltech, worked with Burdick and his new spectrometer to carry out the initial chalcopyrite investigation. Chalcopyrite, or copper iron sulfide, looks very similar to and is easily confused with Pyrite (iron sulfide). Chalcopyrite is also just one of the many minerals to have been labeled “fool’s gold,” because of its shiny bright golden color. (In comparison, real gold is more malleable and is buttery yellow in color.) The major use for chalcopyrite is as an ore for copper, though the yield of copper from chalcopyrite compared to that of other copper-yielding ores is relatively low. Pauling and Brockway’s primary reason for studying chalcopyrite was their mutual interest in inter-atomic distances. The duo was also very critical of the initial investigation of the substance – both the method and the results – by Burdick and Ellis. After an examination of their own oscillation and Laue photographs, Pauling and Brockway concluded that the structure of chalcopyrite is twice as large as was theorized by the Burdick and Ellis examination, and that the distribution of copper and iron atoms is completely different than what was initially reported. 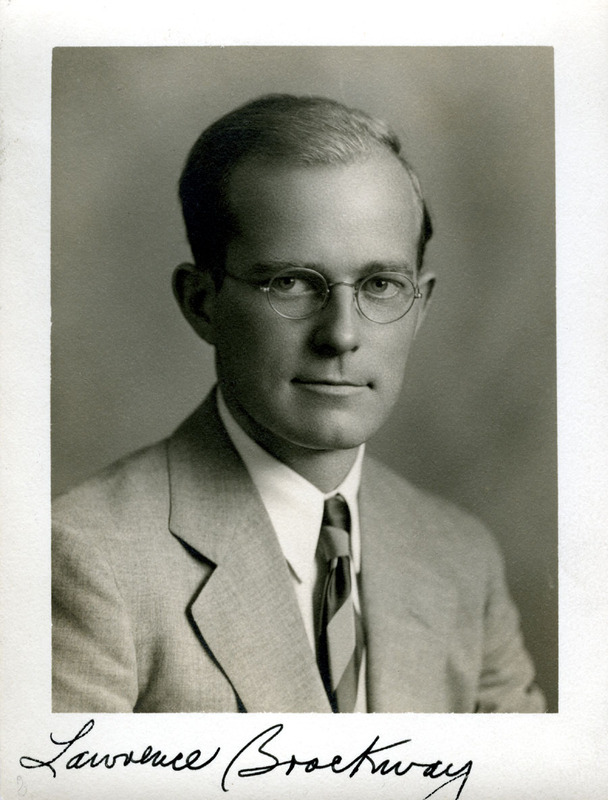 Pauling first began working with Brockway in 1930, when he instructed the new graduate student to construct an electron-diffraction apparatus. Pauling had learned about the electron-diffraction technique from Herman Mark in Ludwigshafen during his trip to Europe in the spring and summer of the same year. Pauling was extremely interested in the possibilities of the technique, and acquired permission from Mark to build and operate the device in Pasadena. After helping Pauling build the electron-diffraction apparatus and publish the analysis of the crystal structure of chalcopyrite, Brockway later went on to set up his own laboratory in Michigan. Pauling references his and Brockway’s work on chalcopyrite in his Research Notebook 8. Those interested in the larger story of Pauling’s achievements in structural chemistry are referred to the website Linus Pauling and the Nature of the Chemical Bond: A Documentary History.